In racing, the car’s brake system is obviously a very crucial safety item, in addition to affecting your racing performance. While stock pads may get you through high performance driving events, you need to purchase brake pads designed to withstand higher temperatures when racing competitively. 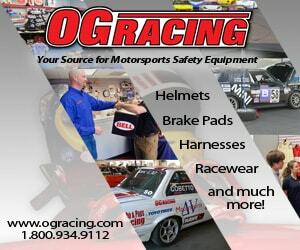 When speaking with vendors, specify that you will be using the pads for wheel-to-wheel road racing, and provide them the weight of the vehicle. If your brake rotors are not in very good shape, this would be a good time to replace them as well. In addition to obtaining the appropriate brake pads, it is important that you flush your vehicle’s brake fluid with racing grade fluid before driving the car on the track. The Repairs and Maintenance section goes into further detail about brake fluids and brake pads. The approximate cost for racing brake pads is between $135 and $150 per set; the cost for ATE brake fluid is between $10 and $15 per liter can. Brake ducts divert air to the brake rotors which in turn cools the rotors. If the rotors overheat, the system’s ability to brake will be negatively impacted. The first question to ask yourself regarding brake ducts is whether or not they are necessary. The answer depends on the car, the tracks you will be racing on, and how you drive. Let me explain a bit further. The car: As a general rule, the faster the car goes and more it weighs, the more the brakes tend to heat up. Again, this is just a general statement, and there are other factors that will impact this theory. The tracks you will be racing on: Some tracks are harder on a car’s brakes than others depending on the amount of hard braking required. As an example, with my car, it is not necessary to have brake ducts when driving Lime Rock Park (CT), Watkins Glen (NY) and Summit Point (WV). Brake ducts are necessary for driving New Hampshire Motorsports Park (NHMS). Again, this is based on my personal experiences with my car. How fast a driver you are: As you gain more experience, your lap times will begin to drop, and your speed will increase. As a part of this process, you will also begin braking harder, and utilizing the car’s brake system more. During my first year, a driver who had a car similar to mine stated that it was necessary to use brake ducts at New Hampshire International Speedway. I responded with a puzzled, “really?” He politely pointed out that I was also going about five seconds per lap slower than him. When I started trimming my lap times, I learned firsthand what he meant. Even if brake ducts are not necessary, they can’t hurt. You don’t want to find out at the end of a straightaway, while going 110 mph, that it really should have been done. Well, maybe I am exaggerating a bit here, since the brakes won’t suddenly disappear on you, but they will gradually fade away. While there are some nice prefabricated brake duct systems available for some cars, you can typically build one yourself for much less money. The first item you need to buy is the brake ducting (hose). While it may be tempting to purchase dryer ducting or other similar materials, they are not capable of withstanding the abuse it will take. If you were to choose this type of ducting, expect to be replacing it often. Instead, purchase high-temperature aircraft ducting from a racing store. This will be able to better withstand the bumps, bruises, and heat than other inferior types. The cost for a 10-foot long, 3” diameter hose is approximately $50. Yes, it is a bit expensive, but well-worth the investment. The next pieces you need are two ducts to collect the air that typically are mounted in the vehicle’s front air dam. While you could purchase two racing ducts made specifically for this purpose for about $32 total, I chose a different route. Instead I bought two 3” to 4” increaser/reducers from a home improvement store for a total of $4. In many home improvement stores, this part is located in the plumbing or dryer areas. Another piece you need are the ducts that are used to vent the air onto the rotors. You may find a race shop that sells the ones to be used with your car, but the cost will often be about $120 for the set. Once again, I used a different approach. During my next visit to the grocery store, I searched some of the aisles that have canned foods and I found some cans that were about 3” in diameter. I then removed the ends of the cans, drilled a hole in each can, and then mounted them to the hub assembly. Although it may not look extremely pretty, it certainly does the job. This only cost me $2.50 in total, and I got a dessert out of the deal. Not bad! The last step is to complete the installation using a few bolts, hose clamps, and racers tape. I used four hose clamps ($4 total) and snugly tightened the hose to the four ducts, then applied racers tape on top of that. Using the method I used, the total cost was under $65 including the aircraft ducting.